Low-level decks are non-raised decks that sit just above the ground and do not typically require steps. There are several design ideas that are unique for low-level decks. These design ideas allow for the optimum appearance and functionality of a low-level deck. Creatively integrate these ideas to suit your personal needs and tastes and to create your own, one-of-a-kind design. Make the most of your low-level deck. A section of the perimeter of a low-level deck is a viable site for a built-in dining area. Attach a bar-style table to the side of the deck. Using materials that match the deck will ensure that the design looks cohesive. Install a small concrete pad or paver stone patio in the ground under the bar for a place to put stools. Guests can sit at the table while you serve from the other side. Manufactured patio stools are available, or you can build your own. Adding a lush collection of plants, such as shrubs, bushes and flowers, around the perimeter softens the otherwise severe edges of a deck. A plant bed border also merges the deck with the surrounding landscape, giving the deck the illusion that it is larger. If you do not want to plant in the ground, use flower pots or planters. Also add lattice work or a pergola, and train climbing plants to grow over it, if you want to enclose the space a bit to create privacy and add shade. 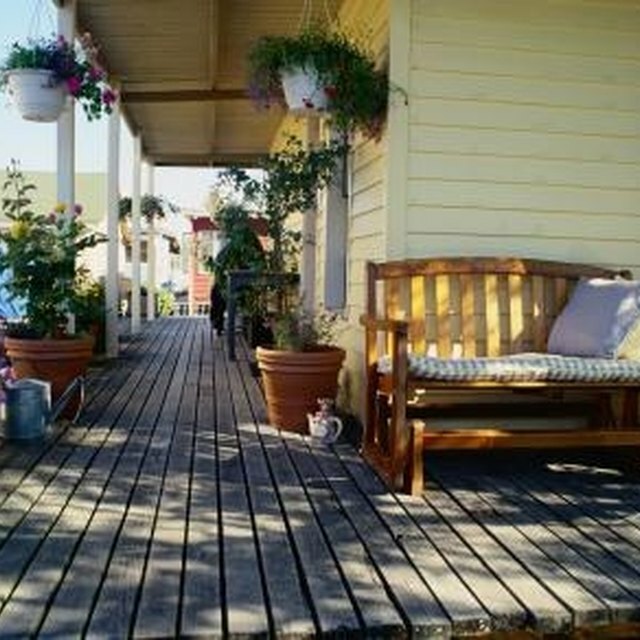 Because a low-level deck does not require steps, people may not know where they are supposed to step off or onto the deck. And you certainly don't want them stepping in your plant bed border. Choose an exit point for the deck and add a few stepping stones to the ground to provide an indicator of where to leave and enter the deck. Manufactured stepping stones are available or you may use found stones. It is up to you whether to embed the stones in the ground or have them sitting on top.